JB12: Middle aged penny, thicker, slower legs. JBB: Barrel char, alcohol, sourdough bread, crisp oak. JB12: Oak, caramel, ancho chili, alcohol, crème fraiche. JBB: Light and creamy. Dolce de leche, alcohol, French lavender. JB12: Full bodied but light. Same as above, but without the herbal note on the back end. JBB: Semi-dry, a bit of yeasty funk, then alcohol and a hint of wood. Doesn’t stick around too long. JB12: More balanced. Caramel, creme brulee, oak, alcohol. Fades fairly quickly. Parting words: Before summing up the tasting notes, I would like to comment on some wording on the labels of these two bottles. 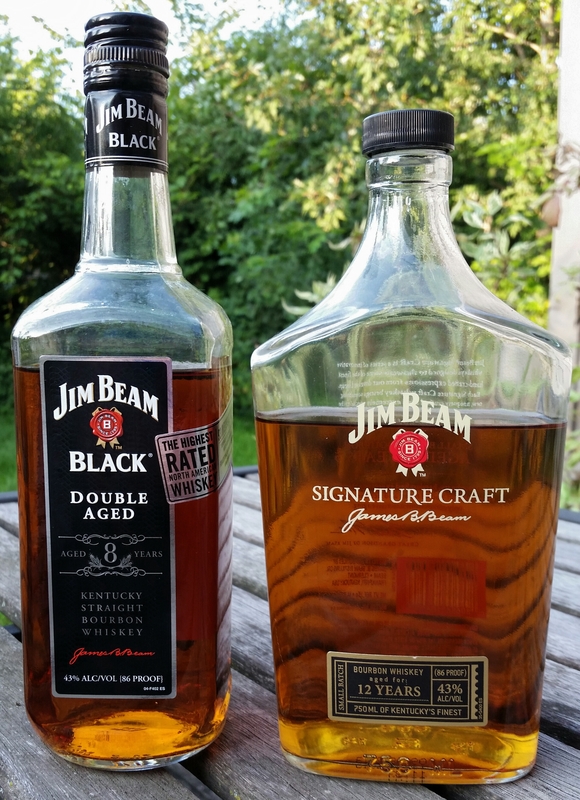 First, Jim Beam Black calling itself “double aged” is a bit silly. All it means in this context is that JBB is aged twice as long as the standard Jim Beam with the white label. Silly and a bit slippery, but no harm done, really. The other bottle is a little more problematic, at least to some. 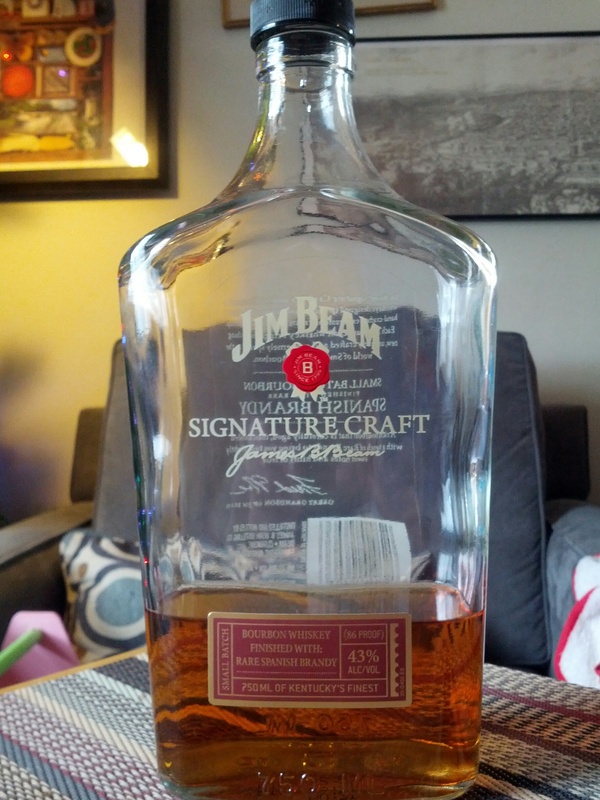 It reads “Jim Beam Signature Craft” with a label lower down on the bottle stating that it’s 12 y/o and 43% ABV. There has been much weeping and gnashing of teeth lately regarding the use of the word “craft” by large producers like Beam and Diageo. The controversy stems from the use of the word by micro-distillers to refer to themselves. Big producers who call themselves craft are, the argument goes, stealing the micros’ thunder and basically lying to consumers. The use of craft by large producers does not bother me in the slightest. In my view, the term has already been emptied of all meaning by these micro producers themselves. ADI and other organizations of micro-producers have allowed too many phonies to claim the name of craft for it to mean anything anymore. There are “craft distillers” who do nothing more than cut whiskey distilled by someone else with local water and claim to be artisans. There are some who don’t even go to that much effort. Even those who do distill their own product often have a brewery make their mash or use prepackaged yeast. Jim Beam does all their own mashing at their three Kentucky distilleries and has at least three proprietary yeast strains. That sounds pretty crafty to me. So I have no problem with Beam using the word for what it does. If the micro-distilling community wanted to protect the sanctity of craft, then they should have done a better job of regulating themselves and come down harder on the fakers. Now that that’s out of the way, let’s get back to the bourbon. Neither of these are bad. The Black has some rough edges but it’s drinkable and refreshing on the rocks on a hot summer day. The 12 y/o (“Triple Aged”?) is more sophisticated and nicely balanced. It works well as a summertime after-dinner pour. My gripe with both of these is the low proof. It’s less of an issue with Beam Black, since it’s fairly cheap and the low proof may help mellow out the funk. It is recommended. There is no justification for a $40 bottle of bourbon like Jim Beam Signature Craft 12 y/o to be bottled at only 86 proof. If Heaven Hill has enough stock to produce a 12 y/o bourbon at over 90 proof for under $30, then Beam can afford to up the proof on its “Signature Craft” series at $40. Because of that, Jim Beam Signature Craft 12 y/o is only mildly recommended. Nose: Leather, alcohol, caramel. Water brings out a weird rotten vegetable smell. Palate: Full bodied and sweet. Cotton candy, plum, oak, oregano, clove. Goes down a little easier with water and brings butterscotch into the mix. Finish: Hot and sweet. Peppermint cotton candy. I don’t know if such a thing exists but if it does, it tastes like this. Milder and sweeter with H2O. Parting words: Baker’s is named after Baker Beam, grandson of Jim’s brother “Park” Beam (not to be confused with Parker Beam, Heaven Hill master distiller) and thus second cousin to Booker Noe. For further confusion, consult the interactive Beam family tree here. It’s is a part of Beam’s Small Batch collection. The other members are Knob Creek, Booker’s and Basil Hayden. Basil is the whipping boy of the group, being no more than Old Grand Dad in a fancier bottle. Knob Creek is very popular and rightly so. It’s the oldest and the only one with line extensions (Rye, Single Barrel, Smoked Maple). 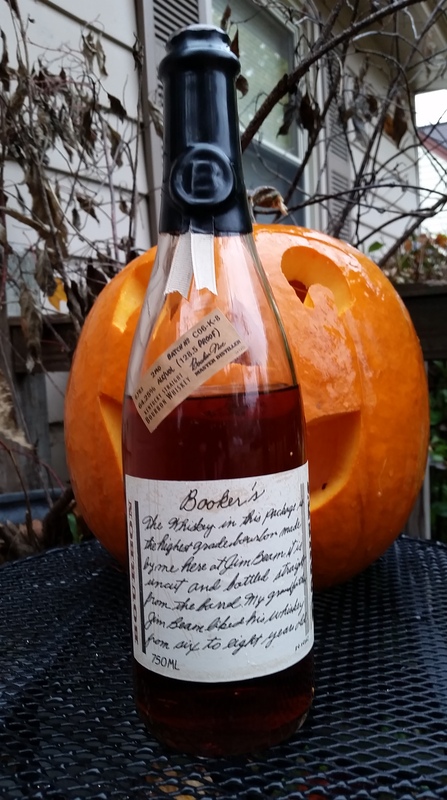 Booker’s is barrel strength and is the sort of flagship of the group, with a 25th anniversary, 10 y/o edition being released soon. Baker’s is 7 y/o and 107 proof and unfortunately occupies the “ignored middle child” spot in the Small Batch family. I bought this bottle when I learned that Baker’s price was going up substantially in Michigan. I hadn’t had it in a very long time and I was pleasantly surprised. I reviewed the now dusty Beam Distiller’s Series last year. It was also 7 y/o and tasty, but Baker’s has a depth of flavor and weight that the DS lacked. This is probably because of the lower barrel entry proof used for Baker’s and Booker’s. It also fares well compared to Booker’s. Booker’s is higher proof but its age has been creeping down as its price has been creeping up. Booker’s currently sells for close to $60 in Michigan, which in my opinion is absurdly expensive for a 6 y/o bourbon, barrel strength or not. Baker’s price has risen in tandem with Booker’s, but it has stayed 7 y/o which gives it the edge over its cousin. The only flaw is the inexplicable rotten garbage smell that came out with water. That problem is easily solved by not adding water or using it very sparingly. Overall Baker’s is a very good bourbon at a decent price. That earns it a recommendation. It was announced earlier this week that Suntory, a privately held Japanese whisky company, will purchase Beam Inc. (owner of Jim Beam, Knob Creek, Old Grand Dad, Maker’s Mark, Laphroaig, Canadian Club, Teacher’s and many other brands) this summer for somewhere between $13 and $16 billion dollars. Online reaction was swift and passionate, to put it kindly. While the response from enthusiasts has been nearly all positive, most of the non-enthusiast response was negative. Much of the negative was xenophobic and some of it was flatly racist. Most of those critical voices can and should be written off as cranks. People claiming that they will no longer drink Maker’s Mark or Jim Beam because their grandfathers fought against the Japanese in the 1940s shouldn’t taken seriously and neither should people who don’t know the difference between China and Japan. My first reaction was was that this news signals a big restructuring in the spirits industry. It is technically an acquisition, but the result will look more like a merger. Suntory already owned two Japanese distilleries, three single malt distilleries in Scotland and the McClelland’s single malt Scotch brand. With Beam’s holdings, Suntory is poised to become the third largest spirits company in the world behind Diageo and Pernod-Ricard. Consolidation has been the theme of the booze world from the 1930s to the present and that won’t be changing any time soon. Beam Inc. itself is the result of a series of mergers and acquisitions over the past few decades. As an enthusiast I was excited about the possibility of new ownership of Beam’s brands, especially since the management of some of those brands has been poor in recent years. Why was the reaction so negative among non-enthusiasts? It’s because they believed what Beam told them. Bourbon marketing is something that most enthusiasts become immune to quickly. A little knowledge goes a long way to dispel the yarns the bourbon industry spins. Yarns like the one that Jim Beam has been made by the same family with the same recipe since the eighteenth century. Or that Maker’s Mark was first whipped up in Bill Samuel’s kitchen and has been a quaint, family-oriented, backwoods operation ever since. There may be tiny threads of truth in both yarns, but they are not true in any real sense. A few minutes reading a book or searching on the internet is enough to dispel most myths like those. The harder ones might take a few hours. Enthusiasts have the inclination to do that . Most drinkers don’t. Those drinkers who don’t are the ones who are angry. They’ve grown emotionally attached from years of hearing those myths. Hearing that their favorite little family business is actually a multinational corporation that is about to be swallowed up by another multinational makes them feel like they’ve been played for suckers. Which makes them angry, which makes them look for someone to direct that anger toward, which is where Suntory and Japan come in. Something that is not a myth is the American-ness of bourbon. By federal and international treaty it can only be made in the U.S. It is mostly made from what we call corn and the rest of the world calls maize, a New World grain, and aged in American white oak. Congressional proclamations have been made about how American bourbon is. Bourbon producers use an appeal to patriotism in their marketing in the U.S. and even overseas advertising and labels themselves stress how American a drink it is. Bourbon producers aren’t the only ones who use this kind of marketing. American automakers have used this angle to sell cars and especially trucks over the years. Like the yarns about the producers themselves, these messages get repeated and work their way into the consciousness of the uncritical whiskey drinkers. For them, drinking becomes a patriotic exercise. What they drink shows how much they love their country. 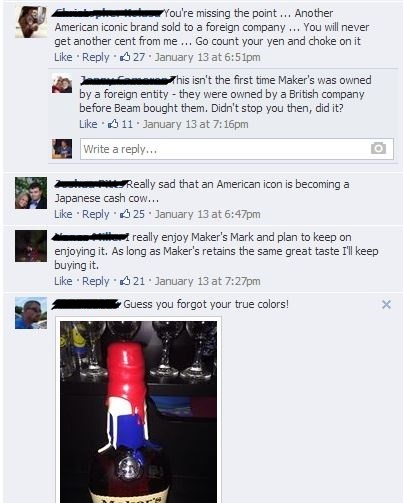 So when they discover that the maker of their patriotic beverage is owned by a Japanese or Italian or British company, they feel, again, played for suckers. Which makes them angry. Where does this leave us? This whole ugly mess should lead drinkers, producers and their marketers to do more thinking about what they’re doing. The producers need to think about if they are setting themselves up for backlash further down the road with short-sighted marketing focused on myth-making or patriotism. For their part, drinkers (and consumers in general) need to take a little more time to know what they’re drinking, how it’s made and who makes it. This means moving beyond skimming the label, it means picking up a book or at least a few web searches. I recognize that most people don’t have the time to do a lot of digging into what they drink, but knowledge is viral. If one person take the time to dig up some good information, that person tells another and that person tells another who might be inspired to do a little more digging herself. Let’s hope that’s what’s happening now. Nose: Cereal, alcohol, butterscotch, leather, old oak, yeast. On the palate: Full bodied and sweet. Butterscotch candy, burn, yeast, a touch of jalapeno. Finish: Hot but sweet. Lingers and tingles for quite some time with butterscotch, burnt caramel, dandelion stem. 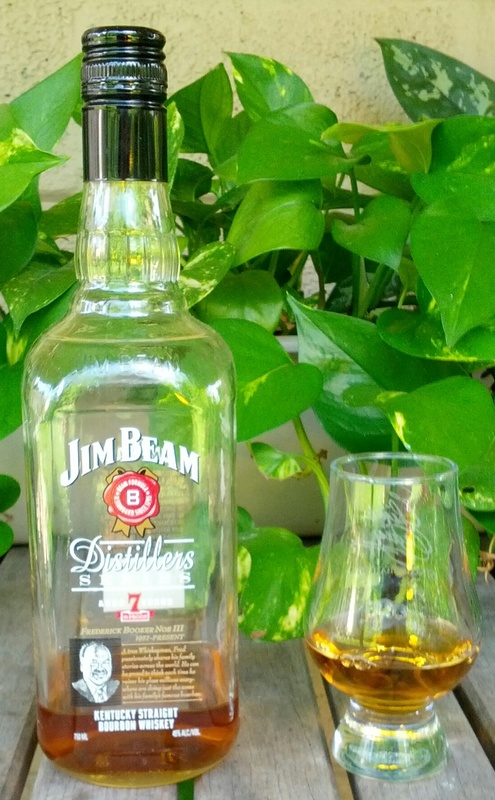 Parting words: The Jim Beam Signature Craft series is a new line from Beam with two parts. One part is a 12 y/o, 86° Jim Beam recipe bourbon and the other is an annual release of a finished or otherwise unusually treated bourbon. The Spanish Brandy Finish is the first of that second piece. This is not a brandy barrel finish, this is finished with a touch of the brandy itself. This whiskey has gotten mixed reviews from enthusiasts, but I think it’s pretty good. Except for the finish, the brandy does a good job of rounding out the rougher yeasty and vegetal characteristics of young Jim Beam. It brings a rich butterscotch sweetness to the nose and palate too. Complaints have also been made about the price. Yes, better bargains can be found for $40, but it’s something different and I don’t mind paying a little extra for that. Beam has been doing a lot of experimentation over the past few years. Not all of it has been successful, but I think this is. It’s worth buying a bottle to have another option for sipping after a holiday meal. Jim Beam Signature Craft: Spanish Brandy Finish is recommended. Appearance: pale copper, thin wispy legs. On the palate: Soft, medium bodied. Alcohol, caramel, parsley. Finish: Alcohol, more dumpster. Fades quickly, thank God. Parting words: I wanted to give this a more positive review, I really did, but it’s just not good at all. I was planning on saying this was another missed opportunity for a good line extension of a heritage brand, much like Early Times 354. It is that, but while ET 354 was dull, Old Crow Reserve is just bad. 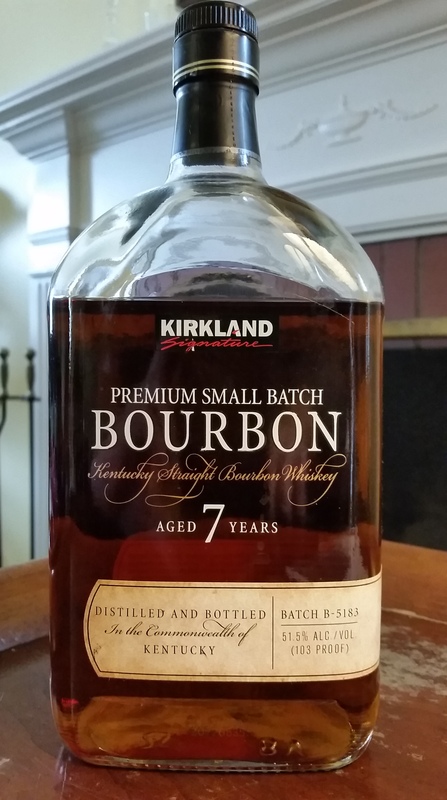 Four years old is not very old for a bourbon, but it’s usually long enough for some of the funk to be taken off, but it actually seems to have increased in this case. I could say more, but nothing needs to be said. If you are desperate for alcohol to put into cola, this might be acceptable. Otherwise, it doesn’t work at all on any level. One of the worst bourbons I’ve had. Old Crow Reserve is not recommended.